During the late hours of 9th September, 2015, Queen Elizabeth II became the longest reigning British head of state. The title was previously held by Queen Victoria, who reigned for 63 years and 216 days. Queen Elizabeth is not only the longest reigning British monarch, but the longest reigning female monarch. Celebrations for the event took place on 10th September, 2015. The coins were released on the 9th September and we received our allocation on 9th October, 2015. We have currently sold out of this product, however you may contact us to be added to our wishlist. 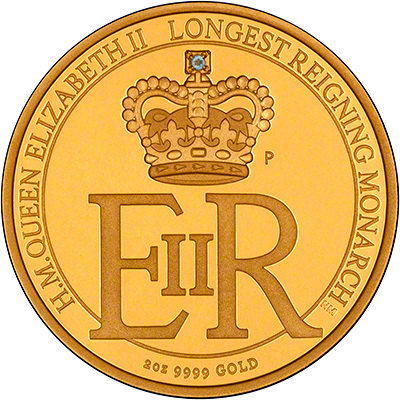 The reverse of the coin shows the Royal Cypher of Queen Elizabeth II with St Edward's Crown on top. It has a handset aquamarine set into the crown, as seen in the actual St Edward's Crown. The inscription reads ~H.M. QUEEN ELIZABETH II LONGEST REIGNING MONARCH". It has the Perth Mint's 'P' mintmark on the lower, right hand side. 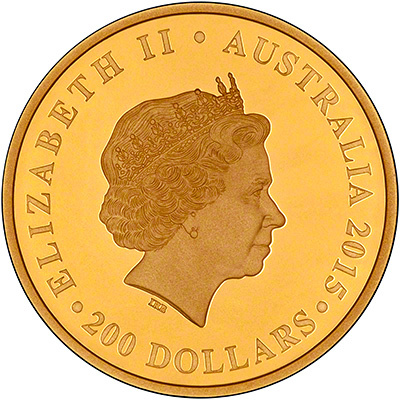 The obverse has the Ian Rank Broadley portrait of the Queen. 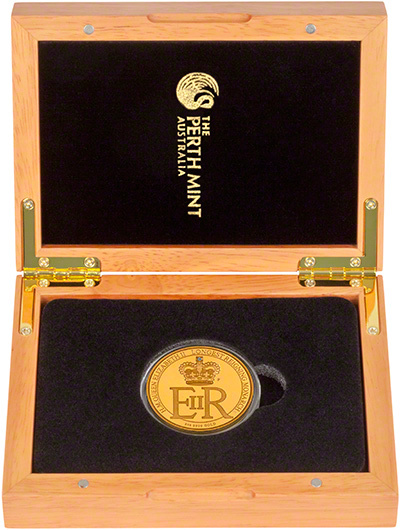 The proof coins are struck in 99.99% pure gold and come in a wooden Perth Mint presentation case, along with a certificate of authenticity. The coin has an issue limit of just 200 coins. The Perth Mint have issued a selection of coins to commemorate the event. To view the 1/4oz gold coins click here. The 1oz silver coin is available here. The Royal Mint have also issued a coin to commemorate the event. We have it available in uncirculated, silver proof and gold proof versions.